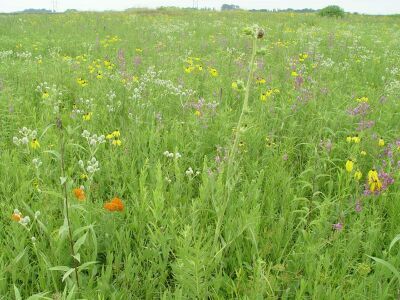 Wisconsin CRP Mixes are specifically designed to meet the Wisconsin Conservation Reserve Program standards. Each state has standards specific to their own state. It is important to purchase seed mixes that satisfy your specific seeding plan. If in doubt on what to purchase or you have questions, don't hesitate to call one of our seed consultants for a free consulation. A broad-spectrum prairie grass and wildflower mix for sites with full sun and medium to dry soils. This mix provides habitat for rare and declining wildlife species by restoring, conserving and increasing the diversity of native plant communities. The more grasses and forbs (wildflowers) the more diverse mix you have to attract wildlife. There are tall mixes and short mixes. Tall mixes are going to provide cover for Pheasant, Turkey and Deer where your short mixes will provide cover for Pheasant, Quail and Prairie Chickens. These mixes provide a food source for the baby chicks by drawing insects to the wildflowers, also feeding adult birds and other wildlife. Upland habitat buffers are field borders planted around crop fields to provide food and cover for quail, pheasant and other wildlife. Grassland dependent bird species have suffered significant population declines due primarily to the loss of habitat. Adding more species of grasses and forbs (wildflowers) will increase population and variety of species. These mixes provide a food source for the baby chicks by drawing insects into the wildflowers, also feeding adult birds and other wildlife.